The World Health Organization states that acupuncture has been found to help as many as 250 health related illnesses. Everything from pain related injuries to depression has been helped with this ancient remedy. Dr. Sayler would be glad to visit with you if you have any questions about acupuncture. Q: Acupuncture: what is it? A: Acupuncture is a method of encouraging the body to promote natural healing and to improve functioning. 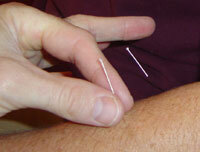 This is done by inserting needles and applying stimulation at very precise acupuncture points. A: The classical Chinese explanation is that channels of energy run in regular patterns through the body and over its surface. These energy channels, called meridians, are like rivers flowing through the body to irrigate and nourish the tissues. An obstruction in the movement of these energy rivers is like a dam that backs up the flow in one part of the body and restricts it in others. The meridians can be influenced by needling the acupuncture points; the acupuncture needles unblock the obstructions at the dams, and reestablish the regular flow through the meridians. Acupuncture treatments can therefore help the bodys internal organs to correct imbalances in their digestion, absorption, and energy production activities, and in the circulation of their energy through the meridians. The modern scientific explanation is that needling the acupuncture points stimulates the nervous system to release chemicals in the muscles, spinal cord, and brain. These chemicals will either change the experience of pain, or they will trigger the release of other chemicals and hormones which influence the bodys own internal regulating system. The improved energy and biochemical balance produced by acupuncture results in stimulating the bodys natural healing abilities, and in promoting physical and emotional well being. Q: What is medical acupuncture? A: Acupuncture is a very old medical art, and there are many approaches to learning and practicing it. Medical acupuncture is the term used to describe acupuncture performed by a doctor trained and licensed in Western medicine who has also had thorough training in acupuncture as a specialty practice. Such a doctor can use one or the other approach, or a combination of both as the need arises, to treat an illness. Q: What is the scope of medical acupuncture? A: While acupuncture is often associated with pain control, in the hands of a well-trained practitioner it has much broader applications. Acupuncture can be effective as the only treatment used, or as the support or adjunct to other medical treatment forms in many medical and surgical disorders. Acupuncture is particularly useful in resolving physical problems related to tension and stress and emotional conditions as well as urinary, menstrual, and reproductive problems. be all that is necessary. Q: Are there any side effects to the treatment? Q: What are the needles like? Do they hurt? A: People experience acupuncture needling differently. Most patients feel only minimal pain as the needles are inserted; some feel NO pain at all. Once the needles are in place, there is no pain felt. 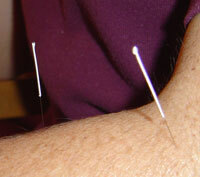 Acupuncture needles are very thin and solid and are made from stainless steel. The point is smooth (not hollow with cutting edges like a hypodermic needle) and insertion through the skin is not as painful as injections or blood sampling. The risk of bruising and skin irritation is less than when using a hollow needle. Because your doctor uses disposable needles, there is no risk of infection from the treatments. A: YES. In the past 2,000 years, more people have been successfully treated with acupuncture than with all other health modalities combined. Today, acupuncture is practiced in Asia, Soviet Union, and in Europe. Acupuncture treatments can be given at the same time as other techniques are being used, such as conventional Western medicine, osteopathic or chiropractic adjustments, and prescriptions. It is important that your acupuncturist know everything that you are doing, so he or she can help you get the most benefits from all your treatments. Q: Do I have to believe in acupuncture for it to work? A: NO. Acupuncture is used successfully on cats, dogs, horses, and other animals. These animal patients do not understand or believe in the process that helps them get better. A positive attitude toward wellness may reinforce the effects of the treatment received, just as a negative attitude may hinder the effects of acupuncture or any other treatment. A neutral attitude (I dont know if I can really believe in this. ) will not block treatments results. Q: Is acupuncture covered by insurance? A: Some insurance companies currently cover acupuncture cost, other companies do not yet recognize the value of acupuncture benefits.